Posted by Unknown / On : 2:30 AM/ Thank you for visiting my small blog here. If you wanted to discuss or have the question around this article, please contact me e-mail at Gps_86@gmail.com. Blackberry bold 9700 sometimes shows insert sim card message while sim has been inserted into the mobile. 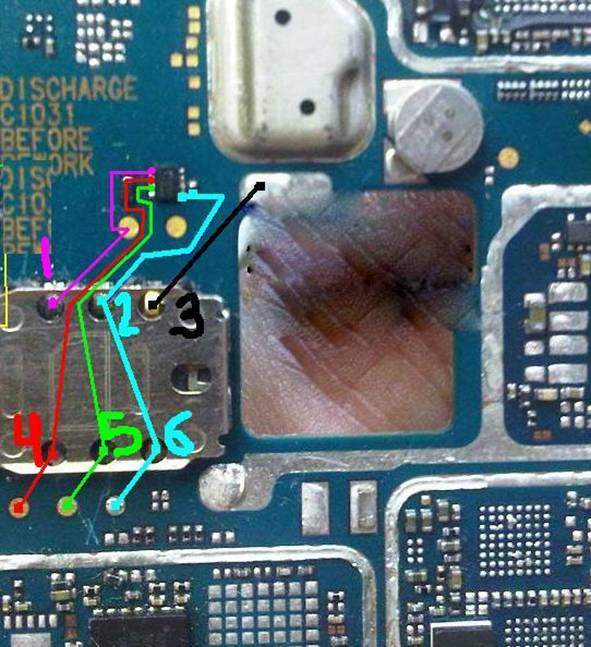 This problem occurs because there is some internal track missing from the sim tray to the sim IC and sometime due to a shorted sim IC. So we can't access the sim in the mobile. 1. First we should change the sim card because sometimes the sim card has internal shorting in a circuit so we can't use it. This is a hidden defect and one you aren't going to detect until you see the insert sim card message on your screen when it shouldn't be. 2. After this open the mobile and clean the sim tray (connector) and then check if the problem still exists. Keeping the inside of the mobile clean and totally free from even the tiniest quantity of debris is a necessity if you expect to be able to use your mobile all of the time. 3. If you haven't managed to solve the problem yet, then we have to check all track continuity from sim tray to the appropriate sim IC connection point as shown in the image below. It's a good idea to try and save yourself this work by remembering to first clean the sim tray, but it isn't always an effective solution. If it doesn't work, then you have no other choice but to begin checking the track. 4. First check the first point shown with the pink mark track to the IC first point. 5. Secondly, check the line from the second point shown with a sky blue mark to IC sixth point. 6. Then check the line from the third point of the sim tray shown with a black mark to the ground. 7. Check the 4th track shown with a red mark to IC point 2 and also to the point jut below this point. 8. Check the 5th point shown with a green mark for the line with the IC third point and a point below this 5th point connection. After all of this is done check on the problem again. If the problem still remains then we have to change the sim IC. We should check the continuity of all the sim tray point lines according to the color mark we had mentioned in the image above for a proper and quick solution. Sometimes it is necessary to go a step further in order to resolve this problem, but ultimately you will find that it is solvable.